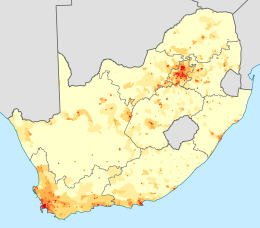 Geographical distribution of Afrikaans in South Africa: proportion of the population that speaks Afrikaans at home. 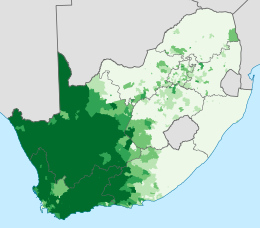 Geographical distribution of Afrikaans in South Africa: density of Afrikaans home-language speakers. South African census figures suggest a growing number of first language Afrikaans speakers in all nine provinces, a total of 6.85 million in 2011 compared to 5.98 million a decade earlier. The 2001 Namibian census reported that 11.4% of Namibians had Afrikaans as their home language. The South African Institute of Race Relations (SAIRR) project that a growing majority will be Coloured Afrikaans speakers. Afrikaans speakers enjoy higher employment rates than other South African language groups, despite half a million who are unemployed. ^ Prince, Llewellyn (23 March 2013). "Afrikaans se môre is bruin (Afrikaans' tomorrow is coloured)". Rapport. Archived from the original on 1 May 2014. Retrieved 25 March 2013.